Over the past few decades, globalization and technological advancements have significantly boosted human mobility. As of 2017, UN DESA estimates that 258 million people – 3.3 percent of the global population – are international migrants. While the proportion of migrants to those who remain in their country of birth is relatively small, the total number of people who cross international borders to live, work, study or seek refuge has grown by 49 percent since 2000, and experts predict that migrant flows will continue to increase in the years to come. Migration has thus become a major issue on the international agenda. In September 2016, the UN General Assembly convened to develop a comprehensive approach to matters involving migrants and refugees – a first in the forum’s history, underscoring the growing importance of international cooperation on migration governance. All 193 UN member states signed the New York Declaration for Refugees and Migrants, signifying global solidarity and commitment to addressing all aspects of international migration, including humanitarian, development and human rights issues. This withdrawal from a landmark international agreement illustrates the tensions brought about by migration, especially in policy areas that represent core components of state and sovereignty. Migration governance has become a balancing act of protecting migrants’ rights while also protecting borders. According to International IDEA’s Global State of Democracy, large migration flows strain democratic institutions’ capacity to effectively integrate migrants into society, and call into question the extent to which governments can and should enable migrants’ political participation. Migration also affects democratic institutions and processes in migrants’ countries of origin as citizens abroad seek to influence policies at home. The figures and political and social developments are impetus for CIFAL Philippines, CIFAL Jeju and the International Institute for Democracy and Electoral Assistance (International IDEA) to jointly convene a workshop on the nexus of migration and democracy, specifically, the challenges to protecting migrants’ rights. 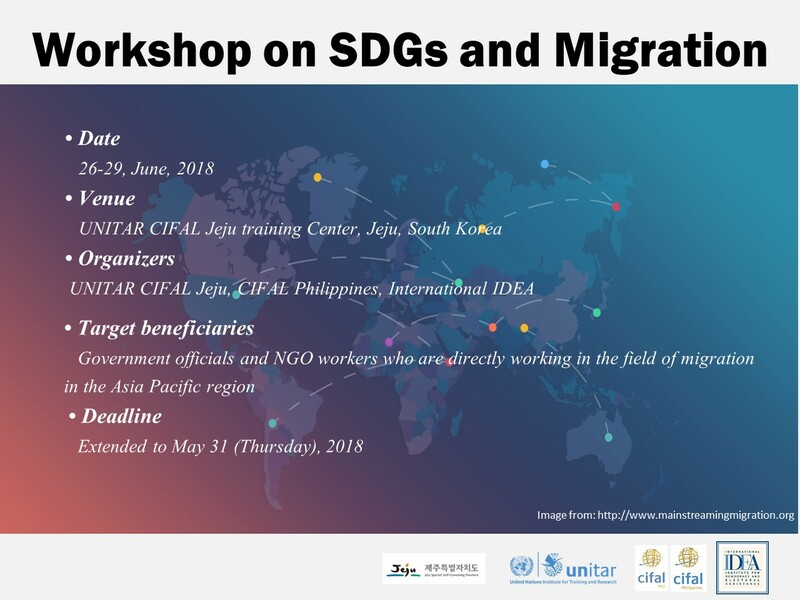 This training is open to local government officials and other related personnel from civil society organizations and institutions who directly work in the field of migration in the Asia Pacific countries. UNITAR CIFAL Jeju/JITC provides a LIMITED financial assistance with the airfareto Jeju-do, Republic of Korea. · All other expenses (local transportation in their country, visa fee) should be covered by the participants. UP students conduct SDG education, inclusive business ideas outreach project in Q.C.